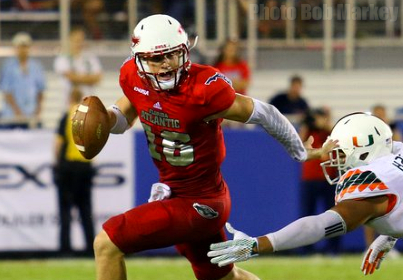 The Florida Atlantic football team challenged Miami, but lost 44-20 at FAU Football Stadium on Friday night. The game took place in front of a record setting crowd of 30,321 fans. UM got on the board first with a four yard touchdown run, but an FAU Greg Joseph field goal cut the lead to 7-3 late in the first quarter. The game was then delayed for just over an hour due to lightning in the area. After a second Hurricane touchdown made the score 14-3, the Owls responded with a 10-play, 83-yard drive capped off with a Nate Terry touchdown catch to pull within four at 14-10. A Michael Badgley 48-yard field goal once again pushed the UM lead to a touchdown, 17-10. However, the Owls responded with another 10-play drive, this one covering 85 yards, to tie to the score at 17 with 3:55 remaining in the half. After forcing a UM punt, the Owls moved the ball to the 27 before a turnover led to a UM field goal, giving the Hurricanes a 20-17 lead. After an exchange of three-and-outs, the Owls muffed a punt, allowing UM to take over on the FAU 16 yard line. The Hurricane offense stalled and a missed field goal allowed the Owls to escape unscathed. FAU took the opening drive of the second half to the UM nine and tied the game with a 32-yard field goal by Joseph. Following the field goal, the Hurricanes scored 24 unanswered points to account for the final margin. Jeff Driskel (photo) was 17-30-2 overall for 155 yards and a touchdown in his first collegiate action. Jay Warren rushed for a career-high 132 yards and a touchdown. Greg Howell added 78 yards on 13 carries. The game was the largest ever to attend a football game in Palm Beach County. FAU will return home on Saturday, Sept. 19 to host Buffalo. The game starts at noon and will air on ASN.